Earth isn’t the only place we’re seeing volcanic ash these days. New high resolution color images from ESA’s Mars Express of Meridiani Planum on Mars – the Opportunity rover’s neighborhood — shows evidence of volcanic ash in a small impact crater that is about 50 km wide. The wind-blown dark material also provides clues to the prevailing wind direction in this region of Mars. These images are stunning, especially in the large hi-resolution versions, so click on each image to see Mars up close and personal. Mars is only about one-half the size of Earth, but yet has several volcanoes larger than anything we have on our home planet. 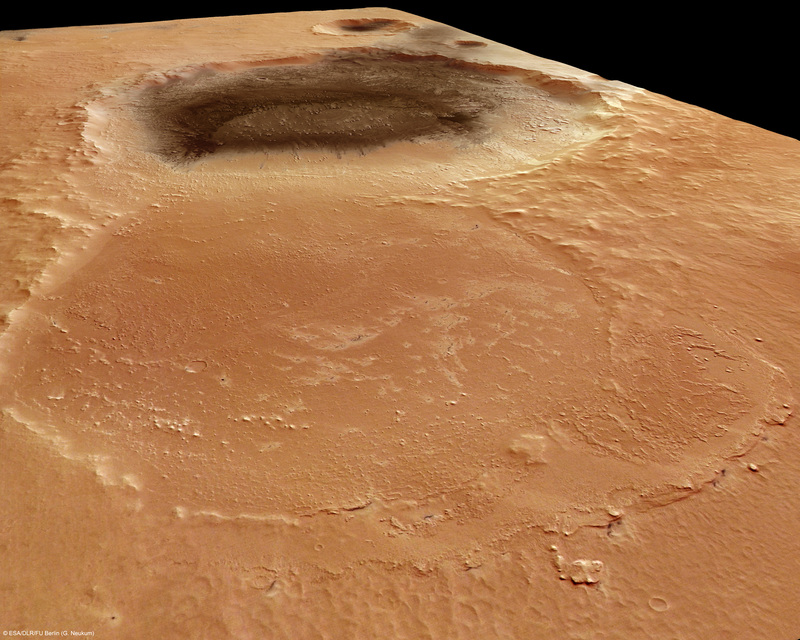 The most massive volcanoes are located on huge uplifts or domes in the Tharsis and Elysium regions of Mars. Meridiani Planum lies close to Tharsis, and is a large plain at the northern edge of the southern highlands of Mars. Poking through the dark covering are small mounds, probably made of harder, more resistant material. The softer material around them has been eroded and blown out of the crater by north-easterly winds and now lies outside the crater, forming dark streaks at the bottom left of the image. Three craters stretch across Meridiani Planum, as seen in this image. The nearest is an old crater, almost worn away. It is 34 km across. The second is covered in dark material, most likely a substance resembling volcanic ash. It is 50 km wide. The third crater, more distant, is smaller at 15 km wide. Again it possesses a dark floor, perhaps because material from the largest crater has been blown out by the wind and has settled in the smallest one. The image below gives a broader perspective of the area. The color images were actually taken in 2005 and were just recently released by ESA. Can larger meteoroid impacts in effect induce a type of volcano? Meteorite Impacts as Triggers to Large Igneous Provinces [PDF]. When reading this I can’t help but wonder, if this is volcanic ash where did it come from and when was it deposited? In a related manner I am sort of asking questions as well. The crater is an impact crater, but the ash appears volcanic (like). Did the impact induce some sort of outgassing from deeper under the martian lithosphere? Can larger meteoroid impacts in effect induce a type of volcano? I love to see an age on that also, at the moment we do think that Mars has been active in recent geological history, i.e last 250 million years, but with an active atmosphere like Mars you would expect this ash to well distributed throughout the region if it was in the order of millions of years. Yes larger meteoroid impacts in effect induce a type of volcano, as the crust and mantle are weakened and deformed but as you probably would guess it all depends on the variables. The prevailing theory is the mares on the moon formed in such a way. 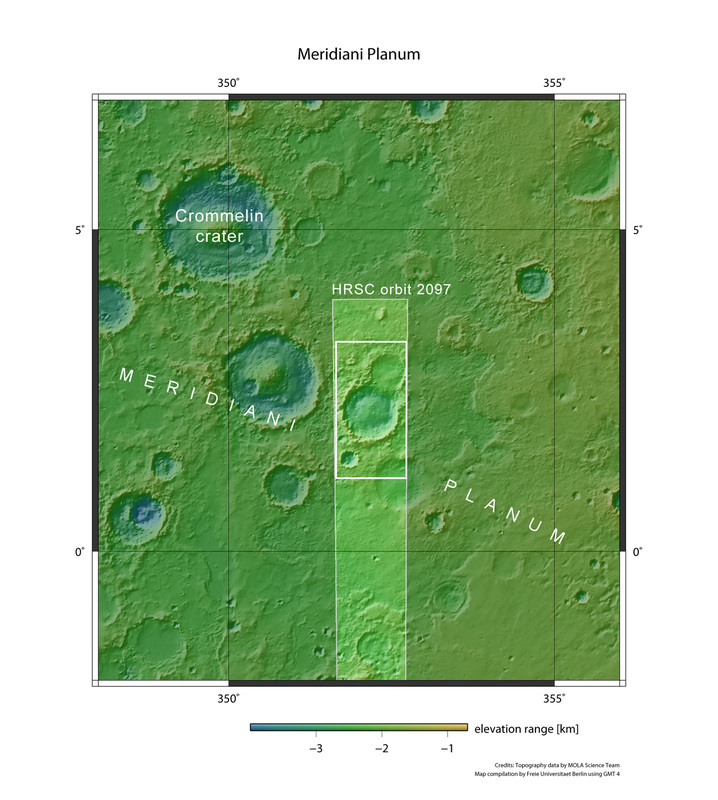 The images above are intriguing because in my interpretation I would say that Meridiani Planum has a weaker crust than average from the images of it, possibly local volcanism and magma chambers in the area, the meteoroid impact could have penetrated the crust and restarted or kick started the volcanism after the impact. Of course that is my personal interpretation of the available evidence. I must say what fantastic pictures, thanks for sharing them with us Nancy. Like, er… it came from a volcano when it erupted. As I see no nearby volcanos erupting, my question asked in good faith still remains unanswered. I appreciate your well-considered thoughts. In the images supplied and indeed in the originals I can see no point or points of origin for outgassing. This certainly does pose a mystery. I wonder how many of Earth’s volcano’s have covered up or hidden meteor impact origins? OR if ‘hot spots’ like Hawaii or Yellowstone were created when a large/dense (NiFe?) object penetrated the Earth’s crust deeper than ‘normal’ – into the mantle? 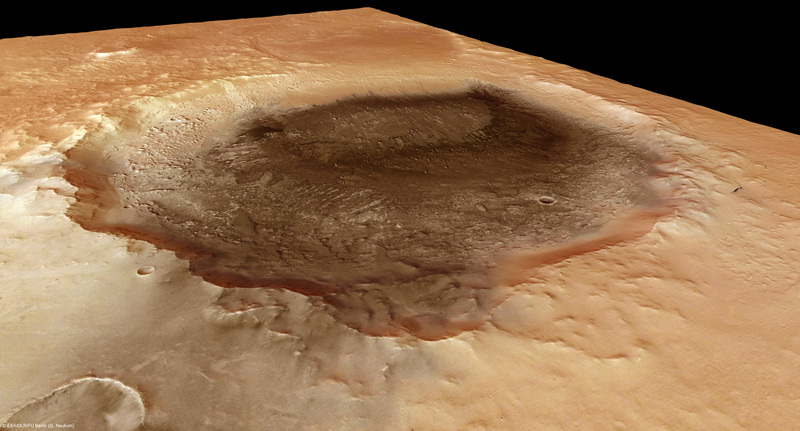 According to the ESA website, the volcanic Tharsis region is to the west of Meridiani Planum — see Google Mars: Meridiani Planum — and therefore one can postulate that the winds on Mars carried and deposited the volcanic ash over that area, sometime ago in Mars’ history, as what often happens here on Earth during volcanic eruptions. @IVAN3MAN_AT_LARGE: I have just scanned the paper so far. The paper seems to focus on the existence of shocked quartz with a volcanic system. Colossal events such as the KT impact interact with the mantle. It is though not clear to me how this generates magma plume activity, unless it is just the melting of olivine from the impact energy which persists as an igneous type of system. Yeah, at the time of posting the link, I also had only glanced through that paper after stumbling across it, which is why I stated that you might find it interesting, but the paper does mention towards to end that “impact volcanism is a testable hypothesis”; however, another paper, referred to in the references, states that “Impacts do not initiate volcanic eruptions” (PDF). Err… that should be towards the end, not “to” at my above comment. D’OH! Now I see that I did not close the damn italic tag! CAN’T WE HAVE A BLOODY PREVIEW/EDIT FACILITY HERE?! I’m glad the annoying shoe finally slipped onto the other foot. PS. Thanks a bunch for the references IVAN3MAN, I’m taking an astrobiology course where this material will find its use. On a smaller planet, such as Mars where there isn’t a lot of gravity, and where the magma is relatively close to the surface… it’s very possible for an object to slam into the planet and create a volcano. It has also been proven if the object is large enough, an object can hit one side of a planet and the shock waves travelling through the planet will actually create enough pressure to create a volcano on the opposite side of the impact. The fact Mars has less gravity than Earth is likely the reason the volcanos there are much larger on average than here. If Earth’s gravity was the same as Mars, the Rocky Mountains would be nearly twice the size they are now. Earth’s gravity is what eventually breaks down the size of all moutains. Hey, how can there be ash on a world with a solid core (as evidenced by Mars’ lack of magnetic field)? Ash is generated by active volcanoes, right? Active volcanoes require a molten interior. But a molten interior (theoretically) would generate a powerful magnetic field a la Van Allen belt. To answer your question, I’ll refer you to this section of Wikipedia’s article on Geology of Mars: Volcanism on Mars. Active volcanoes require a molten interior. But a molten interior (theoretically) would generate a powerful magnetic field a la Van Allen belt. AFAIU our own volcanoes doesn’t relate to a molten interior at large. The magma that is locally melted and can result in volcanoes (as well as other crust production) is from a viscous but solid mantle. Plate tectonics takes place above and in the mantle, and there is a strong correlation between ocean ridges and volcanoes, as well as between “hot spots” and volcanoes. As regards a dynamo source, it’s our outer core that is melted and a putative source IIRC. The volcano lava is likely too small and spurious to affect this mechanism. The over all connection is to the core as a heat source, not as primarily molten.